If you sit down all day, you may notice that you feel stiff and sore- both at the end of the day and first thing in the morning. I’m in my late twenties, and I already feel like an old woman some days. These aches and pains are something that I didn’t think I would experience until I was in my 50s, and it makes me worry that I’ll be in a lot more pain when I’m older. It turns out that sitting down all day (whether in an office like most people, or on the couch or at the kitchen table like many bloggers and freelancers) is one of the worst things we can do for our health. I personally get a lot of lower back pain, something that seems to have come on relatively recently. I don’t know if it’s from crossing my legs a lot as I work, or simply from sitting down all day (which shortens the tendons in your hips, leading to a lot of other problems). The answer? Office yoga. This idea has taken the internet by storm, and I can see why. I used to work in an office all day, and it was easy to forget to get up and only move when I really needed to go to the bathroom. Some days I would kind of blink my way out of a fog and realise I hadn’t left my desk for hours- something that isn’t good for you at all. 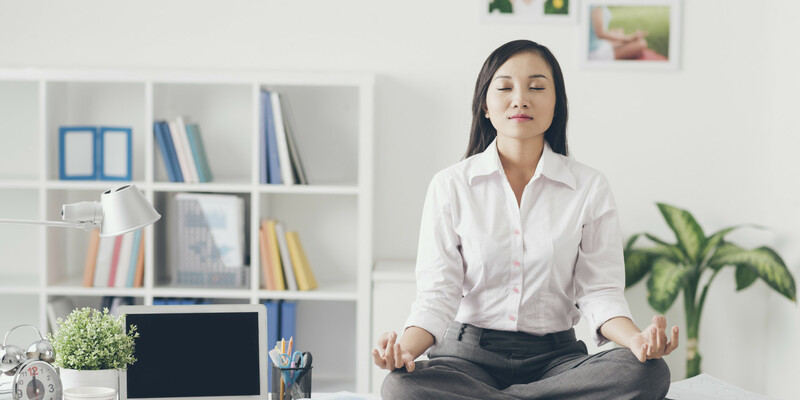 Office yoga is a great way to ensure that you stay flexible while you’re working at office desks. I personally find that I get tight hamstrings, and the Seated Double Hamstring stretch is also excellent for my lower back. It eases leg tightness, improves circulation, and is super easy to do at your desk. Simply sit at the edge of your chair, placing your feet on the floor, stretched out in front of you. Grab a towel or something similar and place it around the balls of your feet. Focus on lengthening your back, lifting your sternum and leaning forward from your hip crease. The idea is to only go as far forward as you can with your knees and back straight (if you can’t get very far forward, don’t worry- this is something that will come with time and it’s more important that your back is straight). I also like the chair spinal twist, which is another great stretch which you can find on the infographic that Furniture Work has released (they teamed up with a yoga instructor). Sit sideways on your chair, twisting your torso towards the right, and lengthening your spine before swapping to the other side. To see how these stretches work, be sure to check out the infographic, and follow @Furniture_Work on Twitter on the hashtag #OfficeYoga to see their video launch next week. Share your #OfficeYoga tips on Twitter @Furniture_Work (via Furniture at Work).